I wrote this book because my students would always ask me what they should practice after class; my answer was “all the stuff we’ve been doing for the last couple of days!” Unfortunately it’s hard to remember all of the details, the nuances, which make those drills useful — and sometimes it’s just hard to remember the drill itself after a couple of very full days of training! At the same time, readers of my other books would write me and ask how they should practice what I’d written about, because they hadn’t yet been able to get to a decent class in their area. There are lots of books that talk about techniques and skills, but very few that show the reader how (and why) those skills should be practiced. These are the people who inspired me to write Handgun Training – Practice Drills For Defensive Shooting. It’s intended as the go-to resource for the concealed carrier or the person with a handgun for home defense to be able to practice defensive shooting skills on their own. You don’t need to have taken a class with me to make use of this book, either! The skills that the drills reinforce are universal and, I think you’ll find, are in sync with the current “state of the art” in self defense education. Even the person who has yet to take a good defensive shooting class will benefit from this book. For each drill there’s an explanation of how the drill is to be performed, but more importantly the reasons for doing the drill in the first place. It explains what specific self defense concept or skill the drill is designed to teach, and gives an explanation of how the drill’s results should be interpreted — along with suggestions on how and what to practice to improve. That’s not all, though! The first part of the book has chapters on concepts and topics relating to defensive shooting practice: why most shooting drills aren’t applicable to defending your life with a handgun; what things you need to practice; how to pick the right range for defensive shooting practice; the best targets to use, and why; how to practice with integrity; introducing movement into your practice; and more! Finally, in the back of the book are some log pages that you can photocopy or scan and use to chart your practice progression; what you did, when and where, and what you learned from that practice session. As I said, the official release date of the book is a couple of weeks away: November 5th, to be exact. It’ll be available for the Kindle (and iBooks on the iPad through the iTunes Bookstore) on that date — but if you want a paper copy, I’ve just learned that Amazon now has them in stock! This may be the first time that one of my books is available in the paper version before the electronic version is out! If you prefer the electronic version, you can order it from the store of your choice now and it will be automatically delivered to your device on November 5th. 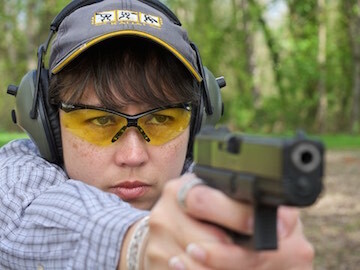 I hope you enjoy Handgun Training – Practice Drills For Defensive Shooting, and more importantly that it proves to be valuable for your defensive shooting skill development! P.S. : My other books are still available as well! Book Of The Revolver, Shooter’s Guide To Handguns, Defensive Revolver Fundamentals, and Defensive Pistol Fundamentals can all be purchased from Amazon and the iTunes Bookstore! Hey Buddy!, I found this information for you: "My new book of defensive shooting drills, HANDGUN TRAINING, is almost here!". Here is the website link: http://www.grantcunningham.com/2015/10/my-new-book-handgun-training-is-almost-here/. Thank you.